Rosalind Brackenbury is the author of several novels, books of poetry, and short stories. She was born in London, England and has also lived in Scotland and France. She earned a history degree at Cambridge University, speaks French fluently, and has been a teacher, journalist and deck hand on a schooner. "Read Becoming George Sand for the beauty of the prose, for the intertwined and compelling stories of two brave and piercingly alive women. Read it most of all, though, for its honesty, the way it reveals and illuminates certain truths and longings that are often believed to be secreted inside only one individual, but are in fact universal. This is not so much a story about having a love affair as it is a study of the nature of love itself. I was absolutely knocked out by it." "I enjoyed Becoming George Sand very much. It is thoughtful, lyrical and adventurous, and I liked the contrasts between glowing Majorca and cold Edinburgh, between past and present, all beautifully orchestrated. George Sand comes across to us as a real woman as well as an important writer, and an inspiring example of generosity and energy." "This is a beautiful, wise novel. The intertwining of past and present, of France and Scotland, of genius and analysis is done with an ease that disguises the consummate skill of the writing. A lovely book." "An elegant novel which offers sensitive and witty reflections upon an astonishingly wide range of topics, Becoming George Sand is a great read and its characters—the struggling writer Maria Jameson and the indefatigable George Sand—are enchanting company." "A wonderful book—filled with wisdom, poetry, and imagery so brilliant I wish I could steal it. Maria is a character to love, whose loves are vivid, embracing, and revelatory. This is a treasure!" "Written with brilliant assurance and a rich, stirring voice, Becoming George Sand is a masterful tale that travels the world in pursuit of its extraordinary characters and takes readers on a journey filled with wisdom and an unforgettable sense of joy and inspiration." "Brackenbury’s fine new novel makes the worlds of present-day Edinburgh and nineteenth-century France both wonderfully real and full of moving emotional drama." "Here is a delicious and devastating account of the lives and loves of two women, one contemporary and Scottish, the other the legendary George Sand; both writers. The parallel lives are tellingly written, and this matters: the story also reveals the persuasive, elusive shadows that writing and reading insinuate into the texture of a life." Throughout the book, Maria compares her time and place (21st-century Edinburgh) with George Sand’s (19th-century France), and tries to determine which circumstances allow a woman to live more freely. “Is it geography, is it history, that determines how we feel about what we do, and how others feel about it, and therefore, what happens next?” (p.49). What do you consider to be the connection between geography and history and morality? Do you believe that morals change (or should change) with time and context? Do you think women were generally freer to live the lives they wanted to back then, or now? Maria quotes Rilke’s idea that “Love is protecting each other’s solitude. Facing outward, toward the world, side by side” (p. 75). What do you think of this definition of love, of partnership? What does it mean to you? Do you see it as ideal? At the book’s opening, Maria waits in a bookshop; Maria refers to the books themselves as “passports”: “Her hands held the book as if it were a passport” (p. 3); “the unread book in her hands, any book will do, as a passport, an alibi” (p. 4). In what other ways do books function as passports or alibis in the novel? How is the bookshop a place where connections are made and relationships built? After Maria and Sean make love, he leaves, and she tidies up: “she can stay in her house, musing and amazed as women have been over the centuries, slow and a little forgetful, pottering and tidying and covering the traces of this time” (p. 12). In what ways have women been doing this sort of tidying over the centuries? How else does Maria relate herself to mothers and wives throughout history? “She has been offered something very beautiful that she never expected to have, and she is not about to start feeling guilty about it. You can love two people, Maria thinks. You can make love with two people, and because it is so different, there is no connection” (p. 15). She says that she refuses to be guilty; does this ever change throughout the book? Do you believe it’s possible to love two people at once? If so, is this a valid justification for pursuing an affair? Do you think Maria’s affair with Sean is different from “garden-variety” infidelity? Do you think there is such a thing? 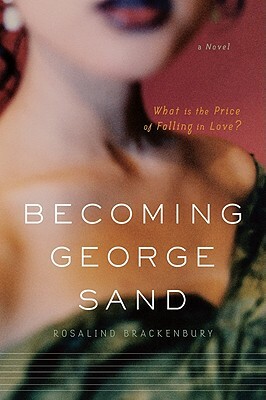 Maria explains her interest in George Sand to Sean: “‘Whatever you think of her writing, her choice of men, she lived an authentic life’” (p. 24). George Sand was famous not just for her writing, but for crossing lines that women of her time didn’t cross—like wearing men’s clothes, and smoking in public, and having affairs. Is this what Maria means by living an “authentic life” or is it something more? What sorts of sacrifices or transgressions would you make or commit in an effort to live “authentically”? On p. 41, Maria states, “If you are Western and middle-class at this time in history, you have to be dislodged from comfort, or dislodge yourself. If you want to live fully, you have to give something up quite deliberately, for nothing is going to do it for you, you are too safe.” What does Maria give up, and does it allow her to live fully? Do you feel too protected to live fully? Do you judge Maria differently for her affair than Edward does, than her children do, than she judges herself? George says, “I need both: muse and lover. I thought they were the same person, always, and they are not” (p. 175). Which is Chopin for George—muse or lover? Does Maria need both a muse and a lover? Does she find both? In George’s dream of the pig-man, Plaisir, he is contrasted with Corambé, the god of the forest. Which does she seem to say is the more potent force? What were Maria’s childhood experiences with the dual nature of reality? What revelation does George’s struggle with Corambé and Plaisir end with? Maria’s friend Marguerite says that unconditional love doesn’t exist between adults. “‘Love like that is for babies,’ Marguerite says firmly. ‘You can’t be loved whatever you do. You have to be someone good, to be loved. People can’t love you for existing.’” (p. 221). Do you agree? Is Jean-Francois judged less harshly in the book for his infidelities, either because he is a man or because he is French? “The habit of loving [Edward] became so ingrained that she did not even notice when it stopped. Perhaps it did not stop; perhaps a part of her goes on loving him still, in the wings, off to one side; but the raw excitement, the unexpected beauty of Sean was surely another feeling altogether, like a new shoot, a new growth. And this part grows on in his absence, getting stronger even as the part that worries about Edward is shrinking. It isn’t even about Sean himself, she notices now; it is about a part of herself that she allowed to lapse for a very long time” (p. 223). What is Maria saying is at the root of her infidelity? Can an affair be a valid form of self-expression? Throughout the book, we see Maria searching for form and structure in writing—both for her own book on George Sand, and for Marguerite’s work. What resolution does she finally come to? How do you see this dilemma in her work reflected in her marriage or her life as a whole? We know that Marguerite was a feminist French writer. How is she similar and different from George Sand? On page 275, Maria reads the work of a French poet on her way home from France. “There is the whole world, the poet says, and there are the details of our lives. What matters is to live at the place where the heart connects with the world.” What has the affair taught Maria about “the place where the heart connects with the world”? What has Marguerite’s death taught her about it? Further, discuss how Maria’s choice of literature affects her view of the world and her decisions, for better or for worse. When Maria runs into Sean at the end of the book, what is her feeling upon seeing him? What lasting effects has the affair had on Maria? On her family? Rosalind Brackenbury writes: “The title is about who we become in our lives. Maria feels herself at one time almost ‘becoming’ George. George also had to ‘become’ George Sand—a pseudonym—as she was born Aurore Dupin. But we all—don’t we?—spend our lives becoming who we will be.” How much influence do we have over who we become? Are you able to see turning points in your life when you became who you are today?